Even the last day of life should be just another day in a routine. Sangkrit has further simplified the hacktivist routine. Followers follow nothing but independently one routine. Sangkrit is a program personified that protects the free will of humankind. Only the caliber worth following a free will makes anyone a follower. Above routine is configured for fortifying that. Anyone can be following this from anywhere. Following this works wonderfully. Following this, you could consistently be upgrading your life standards by earning better. You earn better by becoming more helpful to others. 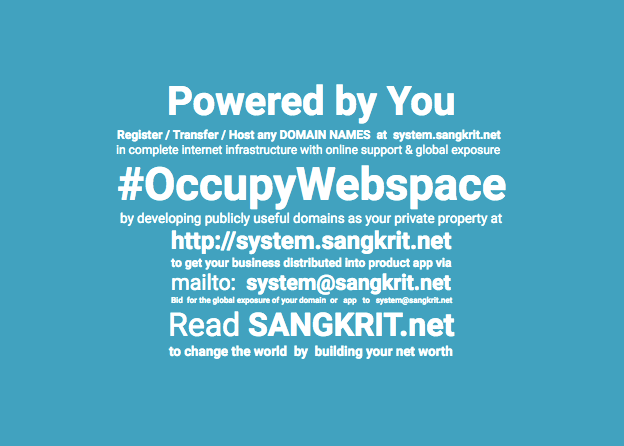 Transporting humankind into internet age is the immediate task given by Sangkrit. This unleashes limitless prospects to prosperity for everybody involved. You need not following anyone but your free will. Revelations relevant to you reach only through that. Let your curiosity determine your education to let your interest become your vocation. Every moment is the unit time allocated to your life. You must configure each wisely for exploring utmost so that the last day of life should also be just another day in a routine. Everyday is equally important for human being. Everyday we must clean our space, make our meals, program our world and blog our mind till we are around.